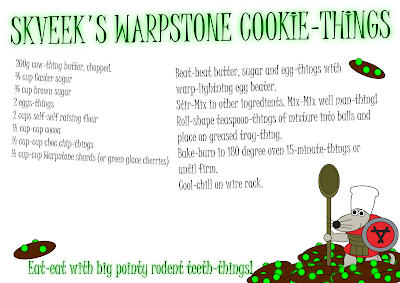 The Warhammer Cook Book: Warpstone Cookies. I've been feeling a bit guilty about not posting anything for a while (I've had a Nurgle lord level cold, which, combined with the renovations to my nose, produced spectacular results), so here's something a little silly. For my mate Pete's birthday earlier this year, I conspired with his brother to produce the Warhammer Cook Book to teach him some basic cooking skills... and TFH guest star Skveek put in an appearance. Check it out! Actually, this is Skveek's second book appearance. 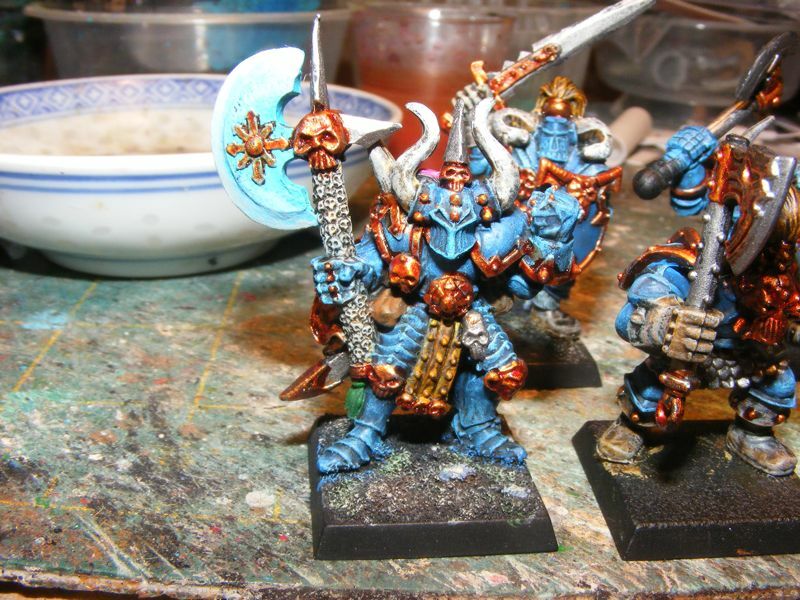 His first ever appearance was in Baby's First Book Of Warhammer, which I made in collaboration with Pete for Greg's son. Later on I re-used him as a guest on TFH. Well, there's a lot more of this stuff (one recipe for every official race, plus Araby and Halflings!) and it might find it's way online at some point if people are interested. PS: I am working on Ishoo Forty. It's just going slowly. You might be wondering what has been going on and why there have been no posts in a while. Well, when Duelling Paintbrushes ended, my esteemed and skaven-sired opponent had a brilliant idea. HGC club member Ben is possessed of more chaos than sense. He is also possessed of no inclination to paint what ever, which means that he has owned some parts of his collection for as long as twenty years (probably more!) without painting them. Since I am possessed of relatively little chaos, but wish to be possessed of considerably more chaos, Greg suggested a cunning trade. I paint Ben's stuff, and in return, I get to keep some of Ben's stuff. So far, I have completed a unit of 28 Tzeentch warriors, and 5 Slaanesh Dragon ogres (yes, I know Dragon Ogres can't be marked, I just painted them in the Slaanesh scheme). 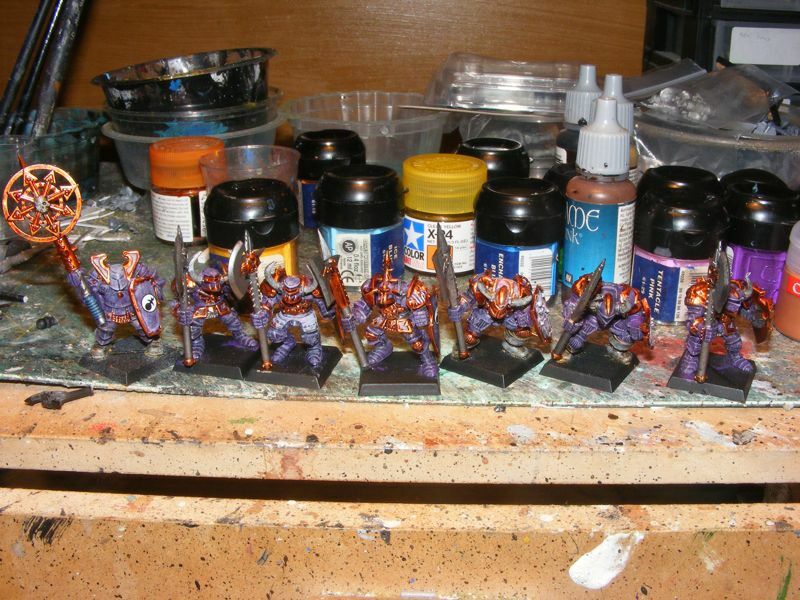 I've also made a fair sized dent in a unit of Slaanesh warriors. Yesterday, I took delivery of yet more models, which means I have the required minis for some big units of Knights, some Marauder Horsemen, and a plentitude of characters, along with an insane plan to convert some war altars. One tremendous benefit of the arrangement is that Ben has so many wonderful old figures I would never be able to get hold of. I've been peppering the units I paint with these - many of which I have never seen before! Since Ben will not trade them to me (they are worth a lot after all!) I am painting as many of the really old things as I can so I can atleast have my fun with them. 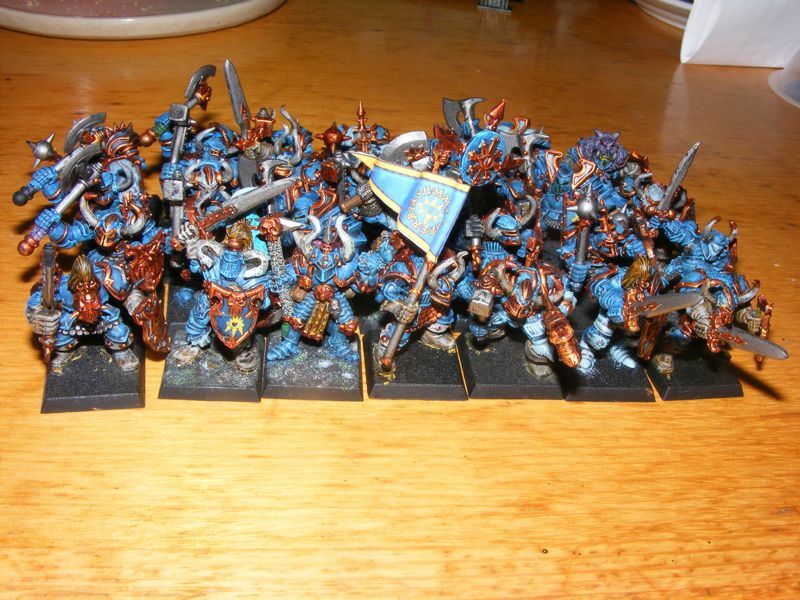 Here's the Tzeentch unit, complete apart from bases.